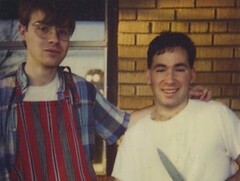 I was too young and dumb to realize it at the time, but years ago something momentous happened in the kitchen of Freak Nation, a big, old Northern Virginia house I shared with three other twenty-year-olds like myself. They say necessity is the mother of invention, but sometimes hunger can be, too. You see, one evening after work, driven by a fierce appetite and an extreme economy of means, John quite spontaneously invented cucina povera right there in our test kitchen. I remember Rex and I walked into the kitchen and asked "what's cookin'?" and John rather proudly showed us his latest creation. It didn't really smell like much, and it just looked like a gleamin', steamin' heap of plain pasta, so we asked him, "What do you call it?" "Pepper Pasta," he told us--basically, spaghetti, butter, and black pepper, or "Butter Spaghetti with Black Pepper." Rex and I literally couldn't stop laughing at the time--we still laugh about it just about every time we see each other--but, really, who's laughing now? Because, you know, John may have just been in early-'90s-postgraduate-bachelor mode, cooking the cheapest, quickest thing he could think of, but he was onto something. "Butter Spaghetti with Black Pepper" may not have been a thing (although, who knows, it probably is--cacio e pepe certainly is, and burro e pepe sounds like it could be a tasty dish), but cucina povera is as real as it gets. What is cucina povera? Well, it's pretty much what it sounds like: it's Italian for "the cuisine of poverty," "poor food," or "peasants' food." In other words, it's the term that's often used to describe Italy's most basic, honest, and elemental dishes. And it's a good thing to know about, because most of the dishes that fall under this category are both simple and tasty, and they're also meat-free. In fact, with Lent upon us, this is really a great time of year for such dishes. Michelle and I have a bit of a thing for these kinds of recipes from around the world. One of our favourite discoveries from a few years ago, back when the subprime mortgages market collapsed and the global economy teetered on the edge, was a recipe that we found in George Lang's The Cuisine of Hungary that seemed ideal for the times. It was called Caraway Soup, and it basically consisted of water, salt, and toasted caraway seeds. * Sounds ludicrous, but it was actually pretty satisfying, and if you bourg-ed it up a little with some chicken broth instead of water and some croutons, it was downright delicious. Anyway, we're still firm believers in such recipes, and our favourite recent cucina povera recipe is a pasta dish that's really not that much more involved than John's Butter Spaghetti with Black Pepper. This one comes from David Tanis's One Good Dish: The Pleasures of a Simple Meal, it's called Spaghetti with Bread Crumbs and Pepper, and it's an unbelievably simple weekday stunner. In fact, Tanis comes right out and states the following: "For me, this frugal pasta dish ranks among the best things to eat. It has the same appeal as pasta alla carbonara--and it satisfies even without the pancetta, cheese, and eggs." And, you know, I think he's right--on both counts. The secret, in my opinion, has to do with three things: crushed red pepper flakes, fennel seeds, and using hand-torn bread crumbs whenever possible. It's these three ingredients that really elevate this dish. 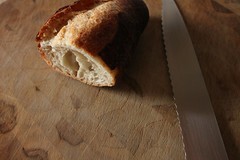 With a serrated knife, saw the baguette into thin slices. Crumble the bread with your fingers, which will produce a nice mixture of coarse and fine crumbs. Heat the 2 tablespoons olive oil in a wide skillet over medium heat. 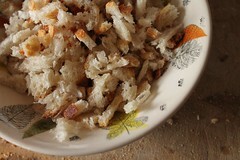 Add the crumbs and let them fry gently and slowly take on color, stirring occasionally. When they are golden and crisp, add the garlic and the fennel seeds and cook for a minute or so. Season the crumbs generously with salt and pepper, and add a bold amount (up to your discretion) of crushed red pepper flakes as well. Remove from the heat. Cook the pasta in boiling well-salted water until just al dente. Drain and toss with the bread crumb mixture. Drizzle a little more oil. Add grated cheese to taste, if you wish. 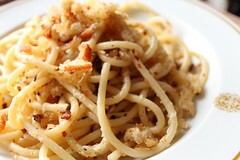 I'd made Spaghetti and Bread Crumbs recipes like this before, but this is the very best version I've ever encountered. For me, the crushed fennel seeds are the genius touch. Use sweet Italian fennel seeds, if you can get your hands on them, or, my favourite, Lucknow fennel, for a somewhat more exotic finish. You might think Tanis is exaggerating about this dish, but he really isn't. Few dishes are as dead easy, or as satisfying. In most Hungarian families, when the housewife has to make ends meet, the egg would be eliminated and lard would be used instead of butter. This is a perfect example of the Hungarian talent for making a delicious dish out of meager ingredients.